Wireless sensing technology delivers the data you need to manage and optimize your operations. Regardless of your industry, the pressure to increase efficiency, reduce waste, reduce energy consumption, and maximize equipment uptimes is constant. Wzzard makes it easy and nonintrusive to capture sensor data from existing equipment and operations, thus facilitating ongoing improvements that lower costs, increase productivity, and reduce waste. Wzzard Wireless Mesh Sensor Network The Wzzard™ Wireless Mesh Sensor Network is an easy to use, complete wireless sensor connectivity platform designed for the rapid deployment of scalable, intelligent, reliable IoT networking in high-demand environments. Because of its efficient distribution of information to individual or multiple receivers, low power usage, and minimized data packets, it is ideal for mobile or remote locations. Wzzard Wireless Mesh Sensor Node (Gen2) - Light Monitoring - 3 AI, vBat Out Wireless Connectivity Where You Need It The Wzzard mesh intelligent wireless sensor platform creates a complete, quick and easy connectivity stack between your sensors and your application, on your network or on the Internet. The platform uses Wzzard mesh wireless sensor nodes, a wireless 802.15.4e SmartMesh IP network to transmit sensor data to the gateway. The SmartSwarm 342 Gateway connects to the Internet via wired connections or cellular data networks. Reliable, Highly Scalable Wireless Network The Wzzard Mesh platform uses mesh networking and time-synchronized channel hopping to provide up to 99.999% connectivity, even in demanding RF environments. New nodes may be added at any time – the SmartMesh IP network dynamically self-configures as nodes are added or removed. This is a function of the mesh network itself and does not need to be controlled by the network gateway. One gateway supports up to 100 nodes. Easy Installation and Configuration Non-intrusive - even portable - network “overlay” is easy to install and remove with no disruptions to your existing network and no downtime. Configuration of the Wzzard mesh sensor platform is easy via the Advantech hub cloud management portal. This AC 100mV/g accelerometer is specifically selected for use with Advantech’s Wzzard Wireless Mesh Sensing Solutions, data collectors, and online systems using two-wire constant current method of drive. The transmitter Vibration/temperature sensor is manufactured to high industrial specifications and rigorous ISO quality standards. When stack lights can talk, they provide a wealthof information that translates to improved productivity and profits. But, whatabout stack lights that cannot talk? Their machines are not networked or there isno software application making use of the data. Those stack lights are nothingmore than a visual indicator, eliminating most of their value and potential. The Wzzard™ Stack Light Monitoring Starter Kitmakes it fast and easy to get data from your stack lights. Simply peel andstick on one or a hundred stack lights to transparently capture light activity andnetwork-enable data. The non-intrusive overlay does not interfere with yourexisting network nor disrupt live operations. Lower energy and maintenance costs and downtime through data driven maintenance plans. Reactive Maintenance plans wait for a failure to occur, causing huge maintenance expenditures and expensive down time. Preventative Maintenance plans eliminate the unplanned down time at the expense of sub-optimal and necessarily shorter maintenance cycles. The best maintenance plan would be to schedule maintenance just before loss of performance. The Wzzard Condition Based Monitoring Starter Kit does just that by providing a non-intrusive, easily installed solution for monitoring the temperature and vibration level of your motor or bearing without disrupting existing operations. · Includes everything you need to monitor temperature and vibration on one motor or bearing. · No equipment downtime, simply attach the sensor with the included magnetic base, connect the sensor to the wireless Wzzard node and provide an Ethernet connection to the gateway. · Dashboard, data trend lines, email/SMS alerts and data logging capabilities are supported. · Easily expand the Starter Kit system simply by adding additional Wzzard nodes and sensors to your existing gateway. · Fast deployment of Proof of Concept and Pilots. Easy to scale to hundreds or thousands of inputs from one location or multiple locations. The flush mount sensor saves space while providing a non-contact way to indicate door open/closed status. The sensor works side, top, or bottom mounted as long as the two pieces are within 0.75" of each other with the door closed. The Breakout Cable provides a 10K thermistor along with easy connections to other sensors. Plug in the BB-WCHMS door sensor. Wire any analog sensor to the stripped and tinned wires. Seamlessly integrate data from diverse systems, devices and sensors into the Industrial Internet of Things.The SmartSwarm 342 IIoT gateway helps owners and operators of remote assets integrate data from those assets into IIoT applications such as dashboarding, analytics or predictive maintenance. Data can be collected from a number of sources, including web feeds or databases and locally connected physical devices and sensors. SmartSwarm 342 includes an interface and manager for B B SmartWorx Wzzard wireless sensor platform for acquiring and transmitting sensor data wirelessly without the time or cst involved in installing cables. For bulk I/O requirements where cabling is not an issue, it is also compatible with Advantech’s WISE and ADAM Ethernet connected I/O modules. User Applications - SmartSwarm 342 offers flexible data acquisition, processing and handoff via an inbuilt Node-RED user application environment. Node-RED is a powerful, simple to use application programming environment for processing data streams. Users drag and drop function nodes to acquire, process and output data via an internal web server interface provided by the SmartSwarm 342. The Node-RED environment is containerized, meaning that any user error made in programming cannot crash the gateway, which will remain connected and available for remote management in order to correct the error without the expense of a site visit.In addition to local data processing, the Node-RED environment is able to create and serve local dashboards, providing a mechanism to serve summary data to engineers, managers or operational staff. Connectivity and Security - SmartSwarm 342 connects to enterprise applications via a local Ethernet WAN, or wirelessly via an internal cellular modem. It can also switch between these connections for redundancy. In addition, the gateway provides a second Ethernet port for a local LAN connection, bridging traffic from this LAN to its active WAN connection. It may be used as a cellular modem allowing any local Ethernet enabled device to obtain an outbound WAN connection. All inbound WAN connections are prohibited, by default, via an internal firewall and all enterprise communications can be via VPN with device authentication and message encryption, significantly increasing the security of the device. Configuration - Configuration is achieved via the SmartWorx Hub remote configuration management tool. This provides access to all of the configurable parameters, and also allows the download of additional Node-RED nodes to enrich the base installed palette without the need to visit the site. Monitor Performance of Your Refrigeration System to prevent waste, maintain quality, and prove regulatory compliance through data-driven refrigeration performance monitoring. Maintaining proper temperature for food and pharmaceuticals ensures quality and prevents costly spoilage losses. Adding a remote wireless monitoring system to refrigerators and freezers provides real-time visibility with instant alerts of out-of-range temperatures or doors left open. The Wzzard Refrigeration Monitoring Starter Kit provides a non-intrusive, easily installed solution for monitoring internal and external temperatures, door open/closed and current draw on refrigeration equipment without disrupting existing facility operations. Easy to Deploy • Includes everything needed to monitor cooling chamber temperature and door open/close along with current consumption of the compressor and fan. • No equipment downtime. Snap-on current clamps and temperature probe connect to Wzzard mesh wireless sensor node and provide Ethernet connection to the gateway. • Dashboard, data trend lines, email/text/SMS alerts and data logging capabilities. • Easily expand the starter kit system by adding more Wzzard nodes and sensors to your existing gateway. • Fast deployment of proof-of-concept and pilots. • The Wzzard mesh wireless sensor node is battery-powered and is easily deployed – no need to install expensive or intrusive wiring. • Included high accuracy temperature sensor can be placed anywhere within the cooling chamber. • Clamp-on current transducers are easy to install without disrupting equipment. Simply clamp them over the hot power lead. • Wzzard’s 2.4 GHz wireless mesh technology continuously optimizes its channel selection to eliminate multipath interference, providing best-in-class reliability in difficult RF environments. • Simple, cloud-based gateway configuration makes it easy to deploy and manage one device or many. Scalable • Scale up from monitoring one unit to hundreds or thousands of inputs - from one or multiple locations. Just add more sensor nodes and make simple dashboard edits. • Expand into a multi-site system integrated into your preferred software platform. Popular MQTT protocol and JSON data format easily integrate into third-party software applications. • Use built-in Node-RED to create and customize applications - no advanced programming skills necessary. Rugged & Reliable • Wzzard mesh wireless sensor node is rated for -20 to 70°C operating range, indoor commercial use – no external enclosure required. • Advanced Smartmesh IP wireless mesh protocol provides excellent point- to-point wireless reliability and becomes more resilient as more nodes are added to the system. Monitor Energy Use of Machines, Circuits and Processes to lower energy cost with data-driven process optimization. Today’s manufacturers and facilities managers have energy eduction programs to reduce input costs and improve their environmental footprint. Often they are managing those programs with monthly utility bill and no insight into energy use or trends of their equipment, processes or circuits. Installing individual energy meters into existing equipment is costly and disruptive to ongoing operations. The Wzzard Energy Monitoring Starter Kit provides a non-intrusive, easily installed solution for monitoring current consumption of equipment, processes or panels without disrupting existing operations. - Includes everything to monitor current consumption of up to three inputs - one three-phase load or three unique loads. Scalable later. - Dashboard, data trend lines, email/SMS alerts and data logging - from one or multiple locations. - Fast deployment of Proof of Concept and Pilots. Easy to Deploy: - The Wzzard mesh wireless sensor node is battery powered and deployed without installing expensive or intrusive wiring. - Simply clamp current transducers over the hot power lead supplying equipment or a pane without disruption, connect to wireless Wzzard node and Ethernet connect to the gateway. - Wzzard’s 2.4GHz wireless mesh technology continuously optimizes channel selection to eliminate multipath interference, providing best-in-class reliability in difficult RF environments. - Simple, cloud-based configuration of the gateway makes it easy to deploy and manage one device or many. Scalable: - Easily scale the Starter Kit later to hundreds or thousand of machine or circuit inputs by adding more Wzzard nodes and sensors - Popular MQTT protocol and JSON data format makes it easy to expand to a multi-site system integrated into preferred third party software applications. - Use built-in Node-RED to create and customize your own applications - no advanced programming skills needed. Rugged and Reliable: - Wzzard mesh wireless sensor node is IP67, -40 to 80°C, rated for indoor and outdoor industrial use, no external enclosure required. - Advanced SmartMesh IP wireless mesh protocol provides excellent point-to-point wireless reliability and becomes more resilient as more nodes are added to the system. Monitor HVAC systems to lower energy costs, schedule preventative maintenance and detect failures early with data-driven performance monitoring. Manufacturing and facility managers use performance improvement programs reduce energy costs and improve their environmental footprint. Often they are managing those programs with nothing more than utility bills and periodic inspections but no insight into the performance of individual HVAC units. Additionally, retrofitting a building automation system is costly and disruptive to operations. The Wzzard HVAC Monitoring Starter Kit provides a non-intrusive, easily installed solution for monitoring current and differential temperature on HVAC equipment without disrupting facility operations. • Kit includes everything to monitor incoming and outgoing air or coolant temperatures and compressor and fan current consumption. • No facility disruption, equipment downtime. • Battery powered - no expensive or intrusive wiring. • Quick installation - Just snap the current clamps on the hot power lead and tie temperature sensors directly into airflow or on high/low pressure lines connected to the Wzzard mesh wireless sensor and provide an Ethernet connection to the gateway. • Dashboard, data trendlines, email/SMS alerts and data logging capability - monitor from one or multiple locations. • Expand the starter kit to hundreds or thousands of inputs by adding more sensor nodes to the existing gateway and making simple dashboard edits • Fast deployment of Proof of Concept and Pilots. Easy to Deploy • Wzzard’s 2.4 GHz wireless mesh technology continuously optimizes channel selection to eliminate multipath interference, providing best-in-class reliability in difficult RF environments. • Simple, cloud-based configuration of the gateway makes it easy to deploy and manage one device or many. Applications • Popular MQTT protocol and JSON data format make it easy to expand to a multi-site system integrated into preferred third-party software applications. • Use built-in Node-RED to create and customize your applications without any advanced programming skills. Rugged & Reliable • Wzzard mesh wireless sensor node is IP67 rated, -40 to 80°C, for indoor and outdoor industrial use – no external enclosure required. • Advanced Smartmesh IP wireless mesh protocol provides excellent point-to-point wireless reliability becoming more resilient as more nodes are added. The Wzzard mesh intelligent wireless sensor platform creates a complete, quick and easy connectivity stack between your sensors and your application, on your network or on the Internet. The platform uses Wzzard mesh wireless sensor nodes, a wireless 802.15.4e SmartMesh IP network to transmit sensor data to the gateway. The SmartSwarm 342 Gateway can connect to the Internet via wired connections or the cellular data networks and communicate. Secure, Reliable and Highly Scalable Wireless Networking - The Wzzard Mesh platform uses mesh networking and time-synchronized channel hopping to provide up to 99.999% connectivity, even in the most demanding RF environments. New nodes may be added at any time, and the SmartMesh IP network will dynamically self-configure as new nodes are added or removed. This is a function of the mesh network itself, and does not need to be controlled by the network gateway. Easy Configuration and Installation - Configuration of the Wzzard mesh sensor platform is easy via the B B SmartWorx Hub cloud management portal. Wireless Connectivity Where You Need It - The Wzzard™ intelligent wireless sensor platform creates a complete, quick and easy connectivity stack between your sensors and application – on your network or the Internet. The platform uses Wzzard mesh sensor edge nodes and a wireless 802.15.4e SmartMesh IP network to transmit sensor data to a SmartSwarm Gateway. The gateway can connect to the Internet via wired connections or cellular data networks and communicate with application platforms using the MQTT IoT protocol and JSON data formats. Wzzard mesh wireless sensor nodes can accommodate virtually any industry-standard external sensors. Connections can be made via M12 connector or conduit fitting. The nodes provide a wide variety of sensor interface options, including general purpose analog input, digital input/output and thermocouple. All nodes contain an internal temperature sensor. Secure, Reliable and Highly Scalable Wireless Networking - The 802.15.4e Wzzard platform uses mesh networking and time-synchronized channel hopping to provide up to 99.999% connectivity, even in the most demanding RF environments. New nodes may be added at any time and the SmartMesh IP network will dynamically self-configure as new nodes are added or removed. Easy Configuration and Installation - Configuration of the Wzzard sensor platform is easy via the SmartSwarm Gateway. Nodes can be configured with scaling information, eng. units, friendly names, geo-location and other descriptive information. The platform simplifies physical installation, too. Nodes can be attached to any surface via mounting ear flanges and screws or the embedded magnetic base. Permanent use of the magnetic mount is not approved for UL installations, but may be convenient for temporary RF link determination or other purposes. The IP67 rated, fiber reinforced polyester PBT housing makes the units deployable in any industrial or commercial environment. Intelligence at the Network Edge - The Wzzard wireless platform places intelligence at the network edge. The Wzzard mesh wireless sensor nodes can be configured to communicate data only when specified threshold or alert levels are exceeded. When reporting, they can associate useful information like geo-location, device name and uptime. This eliminates unnecessary network traffic, eases the processing burden on upstream resources and cuts the cost of cellular data plans when the gateway is using the cellular data network. Thanks to low-power wireless technology and programmable time synchronization, the Wzzard mesh wireless sensor nodes can operate for many years on battery power. NOTE: UL applications - indoor/indoor, with mounting ear installation. The Wzzard platform uses mesh networking and time-synchronized channel hopping to provide up to 99.999% connectivity, even in the most demanding RF environments. New nodes may be added at any time, and the SmartMesh IP network will dynamically self-configure as new nodes are added or removed. This is a function of the mesh network itself, and does not need to be controlled by the network gateway. This split-core current transducer, Model JC24S250-V, is designed for energy management with a convenient connection to electronic sub-metering. It may also be applied for current measurement in a system of distributed power line carriers (PLCs) or remote controls such as SCADA software for automation and supervision. Other applications include security and condition monitoring, load monitoring, protection systems, and predictive maintenance of conveyors, pumps, HVAC motors and more. Clamp-on split-core current transducer, Model JC10F50-V, is designed for energy management with a convenient connection to electronic sub-metering. It may also be applied for current measurement in a system of distributed power line carriers (PLCs) or remote controls such as SCADA software for automation and supervision. Other applications include security and condition monitoring, load monitoring, protection systems, and predictive maintenance of conveyors, pumps, HVAC motors and more. The Wzzard™ intelligent wireless sensor platform creates a complete, quick and easy connectivity stack between your sensors and your application, on you network or the Internet. The platform uses Intelligent Edge Nodes, a wireless 802.15.4e SmartMesh IP network, to transmit sensor data to the Spectre Network Gateway. The Spectre Network Gateway can connect to the Internet via wired connections or the cellular data networks and communicate with application platforms using the MQTT IoT protocol and JSON data formats. The Wzzard™ intelligent wireless sensor platform creates a complete, quick and easy connectivity stack between your sensors and your application, on your network or on the Internet. The platform uses Intelligent Edge Nodes, a wireless 802.15.4e SmartMesh IP network to transmit sensor data to the Spectre Network Gateway. The Spectre Network Gateway can connect to the Internet via wired connections or the cellular data networks and communicate with application platforms using the MQTT IoT protocol and JSON data formats. The Wzzard Intelligent Edge Nodes nodes accommodate virtually any industry standard external sensors. All 802.15.4e Wzzard Intelligent Edge Nodes contain an internal temperature sensor. The BB-WSD2XV0 node includes an integrated accelerometer and an external antenna. The Wzzard™ intelligent wireless sensor platform creates a complete, quick and easy connectivity stack between your sensors and your application, on your network or on the Internet. The platform uses Intelligent Edge Nodes, a wireless 802.15.4e SmartMesh IP network to transmit sensor data to the Spectre Network Gateway. The Spectre Network Gateway can connect to the Internet via wired connections or the cellular data networks and communicate with application platforms using the MQTT IoT protocol and JSON data formats. The Wzzard Intelligent Edge Nodes nodes accommodate virtually any industry standard external sensors. All 802.15.4e Wzzard Intelligent Edge Nodes contain an internal temperature sensor. The BB-WSD2CJA node includes 2 analog inputs, 1 digital output, 2 thermocouple J-type inputs, an external antenna and a conduit connector. The Wzzard™ intelligent wireless sensor platform creates a complete, quick and easy connectivity stack between your sensors and your application, on your network or on the Internet. The platform uses Intelligent Edge Nodes, a wireless 802.15.4e SmartMesh IP network to transmit sensor data to the Spectre Network Gateway. The Spectre Network Gateway can connect to the Internet via wired connections or the cellular data networks and communicate with application platforms using the MQTT IoT protocol and JSON data formats. The Wzzard Intelligent Edge Nodes nodes accommodate virtually any industry standard external sensors. All 802.15.4e Wzzard Intelligent Edge Nodes contain an internal temperature sensor. The BB-WSD2CD2 node includes 2 digital inputs, 2 digital outputs, an external antenna and a conduit connector. The Wzzard™ intelligent wireless sensor platform creates a complete, quick and easy connectivity stack between your sensors and your application, on your network or on the Internet. The platform uses Intelligent Edge Nodes, a wireless 802.15.4e SmartMesh IP network to transmit sensor data to the Spectre Network Gateway. The Spectre Network Gateway can connect to the Internet via wired connections or the cellular data networks and communicate with application platforms using the MQTT IoT protocol and JSON data formats. The Wzzard Intelligent Edge Nodes nodes accommodate virtually any industry-standard external sensors. All 802.15.4e Wzzard Intelligent Edge Nodes contain an internal temperature sensor. The BB-WSD2CA3 node includes 3 analog inputs, an external antenna and a conduit connector. The Wzzard LoRa intelligent sensor platform quickly and easily creates a complete connectivity stack between your sensors and application, on either your network or the Internet. The platform uses intelligent edge nodes to transmit sensor data to a SmartSwarm 243 LoRa Gateway over a wireless LoRa network. The WISE-6610 is a high-performance LoRaWAN gateway that offers reliable connectivity for industrial environments. It supports the LoRaWAN protocol for building LoRaWAN private and public networks, as well as various protocols including MQTT. The hardware and software flexibility of the WISE-6610 provides rich features for edge intelligence systems, and its support for VPN tunneling with various protocols ensures safe communications. The WISE-6610 also provides a network server that can phase the LoRaWAN data in our device. The WISE-6610 provides the redundancy-enhanced functions to prevent connection loss. The WISE-6610 is a high-performance LoRaWAN gateway with reliable connectivity options for industrial environments and LoRaWAN protocol support for building LoRaWAN private and public networks. It also supports other protocols, including MQTT, and its hardware and software flexibility provides rich features to edge intelligence systems. The WISE-6610 allows for VPN tunnel creation with various protocols that ensure safe communication. It also provides a network server that can encrypt and convert LoRaWAN data in the device, and its redundancy-enhanced functions are specifically designed to prevent connection loss. 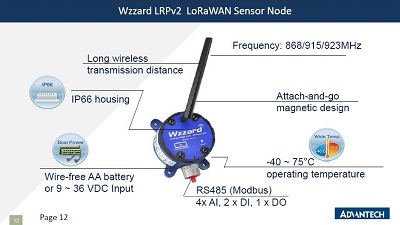 The Wzzard LoRa private node intelligent sensor platform creates a complete, quick and easy connectivity stack between your sensors and your application, on your network or on the Internet. The platform uses Intelligent Edge Nodes, and a wireless LoRa network to transmit sensor data to the SmartSwarm 243 LoRa Gateway. The SmartSwarm 243 LoRa Gateway can connect to the Internet via wired connections and communicate with application platforms using the MQTT IoT protocol and JSON data formats. Wzzard LoRa Intelligent Edge Nodes accommodate virtually any industry standard external sensors. Connections can be made via conduit fitting, cable gland or M12 connector. The Nodes provide a wide variety of sensor interface options, including general purpose analog inputs, digital input/output and thermocouple. The Wzzard LoRa private node intelligent sensor platform enables you to quickly and easily create a complete connectivity stack between your sensors and applications via either a network or the Internet. The platform uses intelligent edge nodes and a wireless LoRa network to transmit sensor data to the SmartSwarm 243 LoRa Gateway, which can connect to the Internet via a wired connection and communicate with application platforms using MQTT and JSON protocols. Wzzard LoRa Intelligent Edge Nodes can accommodate virtually any industry standard external sensors. Connections can be made via conduit fitting, a cable gland, or an M12 connector. The nodes provide various sensor interface options including general purpose analog inputs, digital input/output, and thermocouples. SmartSwarm 243 a is high-performance LoRa gateway with reliable connectivity for industrial environment and close system application. Not only MQTT but also VPN tunnel is supported. Its hardware and software flexibility brings rich features in Edge Intelligent System and full integrity of Advantech IIoT architecture.